This e-book explores some of the most exciting frontiers of atomic, molecular and nuclear physics. Written and illustrated in a simplified manner, this e-book aims to provide insight to its readers how electrons play a major role in the atomic and nuclear collision processes. Indeed, this book contains a wealth of theoretical information and variety of fascinating experiments to unravel the fundamental mechanisms positron, negative, ion, photons, protons, and antiprotons which makes the readers visualize different types of collisions and the physics behind. Each of the nine chapters in this bool are written by prominent scientists from atomic and molecular physics including Prof. R. D. DuBois and A. C. F. Santos. This eBook covers several essential aspects of multiple interaction processes between electrons, nucleus, atoms and molecules. It addresses exciting applications of these fundamental processes, and gives insights in the recent experimental and theoretical developments of leading research groups of these areas. It will provide the researchers of this field a valuable overview of this broad and rapidly evolving field. The various contributions, mostly from Latin-American research groups, show the dynamism of this community in the area of basic molecular processes. The forthcoming facility "Syrius Project" in Brazil will benefit from the expertise of this community and allow the realization of ground-breaking experiments. We hope that this eBook will promote interactions between the researchers of this area and provoke many passionate discussions. This eBook contains nine contributions, covering a diversity of subject areas in atomic, molecular and nuclear physics. Robert (Bob) DuBois surveys the ionization by antiparticles and particles. He compares fully to total differential ionization cross sections and finds where the differences are. His contribution concentrates on the progress and methods used in particles and antiparticles based studies of inelastic atomic interactions. This chapter shows how new experimental techniques are critical in advancing experimental studies from total or integral cross section measurements to highly differential investigations that are now being performed. The primary emphasis is on ionization of atoms and simple molecules by low-energy positrons and in showing similarities and differences between positron, electron and proton impact data. Experimental techniques associated with the generation, moderation, and transport of low-energy positron beams summarizing existing experimental studies are provided. Comments with respect to future studies and directions, plus how they might be achieved, are presented. The chapter by Alcantara et al. deals with photoionization of an important atmospheric molecule, the dichloromethane. Chemical processes are of significant importance in determining the equilibrium distribution of ions in planetary ionospheres. Photoionization and impact ionization are responsible for the initial creation of the electron-ion pairs. Thus, the knowledge of the chemical processes taking place in the Earth`s atmosphere is necessary for the understanding of ionospheric structure and behavior. Thus, the chapter by Alcantara et al. presents the centre of mass kinetic energy release distribution spectra of ionic fragments, formed through dissociative single and double photoionization of CH2Cl2 at photon energies around the Cl 2p edge, which were extracted from the shape and width of the experimentally obtained time-of-flight distributions. The authors report that the kinetic energy distributions spectra exhibit either smooth profiles or structures. In the particular case of double ionization with the ejection of two charged fragments, the kinetic energy distributions present own characteristics compatible with the Coulombic fragmentation model. Intending to interpret the experimental data singlet and triplet states at Cl 2p edge of the CH2Cl2 molecule, corresponding to the resonant transitions, were calculated at multiconfigurational self-consistent field level and multireference configuration interaction. Minimum energy pathways for dissociation of the molecule were additionally calculated aiming to support the presence of the ultra-fast dissociation mechanism in the molecular break-up. Paulo Limão-Vieira and colleagues revisit electron transfer processes yielding negative ion formation in gas-phase collisions of fast neutral potassium atoms (electron donor) and biomolecular target molecules (electron acceptor) in a crossed molecular-beam arrangement. The negative ions formed in the interaction region are time-of-flight (TOF) mass analysed as a function of the collision energy. Selective site and bond excision in the unimolecular decomposition of the transient negative show clear dependence on the collision energy. 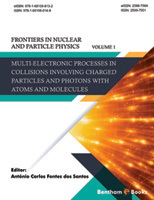 The chapter by Santos and Almeida aims to the study of electron correlation in atoms, which is a significant but difficult study subject to its many-body interactions, nevertheless it may be the main process to describe the absolute electron impact cross section for the ionization of atoms and molecules. The outer-shell double photoionization of a multi-electron target is usually a weak process in comparison to single photoionization and it is determined completely by electron-electron interaction. The main scope of this chapter has been upon a review of the recently found relationship between shake-off probabilities and target atomic number and electron density. By comparing the saturation values of measured double-to-single photoionization ratios from the literature, a simple scaling law was found, which allows us to forecast the shake-off probabilities for several atomic elements up to xenon within a factor two. The electron shake-off probabilities accompanying valence shell photoionization have been scaled as a function of the target atomic number, and static polarizability. Claudia Montanari analyzes the multiple ionization by the impact of singly charged projectiles: electrons, positrons, protons and antiprotons. This comparison allows to study the mass and charge effects on the ionization processes. To that end Dr. Montanari includes the theoretical description given by the continuum distorted wave eikonal initial state, and a detailed compilation of the experimental data available for particle (proton and electron) and antiparticle (antiproton and positron) multiple ionization of the heaviest rare gases. The multiple ionization results include the Auger-type post-collisional contribution, which enhances the number of emitted electrons. For heavy projectiles, this is important at high energies. For light projectiles such as electrons and positrons, the Auger-type processes dominate the highly-charged ion production in the whole energy range, even close to the energy threshold. For this reason, the theoretical calculation of multiple ionization values requires good description of the deep-shell contributions. In a work involving researchers from USA, Canada and Brazil, the fragmentation of the tetrachloromethane molecule, following core-shell photoexcitation and photoionization in the neighborhood of the chlorine K-edge is presented by using time-of-flight mass spectroscopy and monochromatic synchrotron radiation. Branching ratios for ionic dissociation were derived for all detected ions, which are informative of the decay dynamics and photofragmentation patterns of the core-excited species. In addition, the absorption yield has been measured, with a new assignment of the spectral features. The structure that appears above the Cl 1s ionization potential in the photoionization spectrum, has been ascribed in terms of the existing connection with electron-CCl4 scattering through experimental data and calculations for low-energy electron-molecule cross sections. In addition, the production of the doubly ionized Cl2+ as a function of the photon energy has been analyzed in the terms of a simple and appealing physical picture, the half-collision model. Tőkési and Varga present a theoretical description of the spectra of electrons elastically scattered from various samples. The analysis is based on very large scale Monte Carlo simulations of the recoil and Doppler effects in reflection and transmission geometries. Besides the experimentally measurable energy distributions the simulations give many partial distributions separately, depending on the number of elastic scatterings (single, and multiple scatterings of different types). Furthermore, they present detailed analytical calculations for the main parameters of the single scattering, taking into account both the ideal scattering geometry, i.e. infinitesimally small angular range, and the effect of the real, finite angular range used in the measurements. The effect of the multiple scattering on intensity ratios, peak shifts and broadening, is shown. The authors show results for multicomponent and double layer samples. Our Monte Carlo simulations are compared with experimental data. Ginette Jalbert et al present a contribution that relates molecular and atomic physics with the fundamental of quantum mechanics. This chapter reports the accomplishment of successful measurements in detecting two metastable atoms H(2s) metastable atoms arriving from the dissociation of the same hydrogen molecule induced by electron impact. Two detectors, placed close to the collision center, measure the neutral metastable H(2s) through a localized quenching process, which mixes the H(2s) state with the H(2p), leading to a Lyman-α detection. The data show the accomplishment of a coincidence measurement which proves for the first time the existence of the H(2s) + H(2s) dissociation channel. These results may stimulate theoretical computations regarding the production of H(2s)+ H(2s) coming from the doubly excited states, by electron impact, of the molecular hydrogen. In addition, an emerging pair of atoms with mean lifetime of the order of 0.1 s and with polarized angular momentum (polarized spin or polarized total angular momentum) may provide a new manner to obtain insight into the complex field of the molecular interactions, from the short-distance to the long-distance domain of interactions between moving atoms. Besides, the authors present a proposal to test the spin coherence of molecular dissociation processes. Clearly, the H(2s) + H(2s) dissociation channel has a great potential as a coherent twin-atom source. Finally, most of the knowledge of the atomic nucleus was obtained from experimental data involving stable nuclei or nuclei in the vicinity of the stability line. Since the 1980s, several intermediate energy laboratories in the world started to produce nuclei out of the stability line, Rare Ion Beams. Many new interesting phenomena related to these nuclei have been discovered so far. Light nuclei far away from the stability line such as 6,8He, 11Be, 11Li, 22C, 24O and others have been produced in laboratory. Some of these nuclei present a pronounced cluster structure formed by a core plus one or more loosely bound neutrons forming a kind of low density nuclear matter around the core (nuclear halo). Most of the research involving RIB was developed at intermediate energies, from 30 up to hundreds of MeV/nucleon, and more recently, some facilities are producing secondary beams to perform scattering experiments at energies around the Coulomb barrier. Heavy ion elastic scattering angular distributions at incident energies close to the Coulomb barrier, when plotted as a ratio to the Rutherford cross section, frequently exhibit a typical Fresnel type diffraction pattern, with oscillations in the forward angle region. This behaviour is a consequence of the interference between the Coulomb and nuclear scattering amplitudes. Due to the low binding energies of exotic projectiles, the coupling between the elastic channel and the breakup states of the projectile is very important and strongly affects the elastic angular distributions, with a damping of the Fresnel oscillations and the complete disappearance of the Fresnel peak in some cases. To describe the effect of the breakup of the projectile in the elastic scattering, new theoretical approaches have been developed. Viviane Morcele and colleagues present elastic scattering angular distributions at energies a little above the Coulomb barrier. The angular distributions have been analyzed by Continuum-DiscretizedCoupled-Channels calculations to take into account the effect of the 6He breakup on the elastic scattering. Two different approaches were used to describe the structure of the projectile. One considering the 6He as a three-body system consisting of an alpha particle and two neutrons which, in addition to the target, form a four-body problem. To compare, in a second approach, the projectile is described as a two-body cluster formed by an alpha particle plus a di-neutron. A new kind of effect due to the projectile breakup in the elastic scattering angular distributions is reported. I would like to thank the authors for their contributions and cooperation in assembling this ebook.